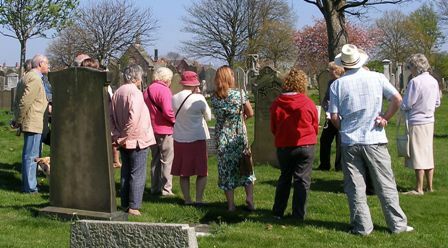 The Friends of Rake Lane Cemetery is a group dedicated to helping the local authority secure and enhance the cemetery grounds. We hold monthly open meetings that are attended by all interested parties. Guided group tours are available on request. The themed walks include Major Shipping Disasters; Local and Maritime History and World Wars I and II. The Friends group was formed at the end of 2006, following a sustained attack by vandals. They had done irreparable damage to many of the beautifully sculptured old gravestones in the cemetery. Wirral Borough Council spent a considerable sum on improving the security of the perimeter fencing. Roger Calvert, Principal Officer Parks & Countryside, (now retired) unfailingly supported the Friends, providing valuable and constructive help. With funding from various area forums, the Friends were able to provide extra security and new lighting for the Chapel. This has enhanced the security of the building. Also, we were able to contribute towards the work of Father Paul and his congregation in renovating the Chapel. Recently we received 5,000 pounds from the Police Fund towards the cost of new fencing between Earlston Gardens and the cemetery. New gates have also been erected at the Seaview Road entrance. Please note. We can undertake research locating graves but we will make a charge of 10 pounds, if successful. This covers the time taken to find the information and take photographs. You can either use our Paypal account or post a cheque.